The Pileated Snagret (アカヘビガラス?, lit. 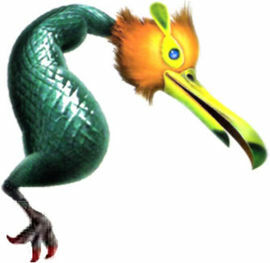 : "Red Snake Crow") is the most powerful species of the Snavian family, and the boss of the Snagret Hole in Pikmin 2. It has a green scaly body, and a head larger than that of the Burrowing Snagret, which is coloured with red-orange feathers. It is called "pileated" because it has a crest of feathers on its head. Its eyes are also covered by some ear-like features. Compared to the Burrowing Snagret, this Snagret is definitely more powerful, as it has a lot more health, and is able to walk on the ground. It is also much taller than its more common cousin. The Pileated Snagret is found only in Pikmin 2. It can only be found on sublevel 7 of the Snagret Hole, sublevel 4 of the Hole of Heroes, and the last (2) sublevel of the Rumbling Grotto in Challenge Mode. "You'll encounter the Pileated Snagret on the final floor of the Snagret Hole. It's nastier than the Burrowing Snagret, and it hops, too. Toss Pikmin at the creature's noggin, call them after they're thrown, and keep your troops away from the boss's beak." This snagret's height makes it very hard to hurt it by throwing Pikmin onto it. The Pileated Snagret is also more sensitive to attacks, which means that it will burrow back into the ground before your Pikmin can do much damage. However, Purple Pikmin are the best choice, because it is still possible to throw them on the creature with good aim, but an ultra-spicy spray is strongly advised so that they can run fast enough, and cause enough damage. The reason Purple Pikmin are great here is that when the creature emerges from the ground, the Purples will make the Snavian 'bounce', like in most cases of enemies, and in the small seconds of those bounces, the Pikmin attached to the Snavian will deal damage, and then it will probably return to the ground without eating any Pikmin. Sometimes, it may get stunned, making it extremely vulnerable. When this tactic is repeated, it should be easy to defeat the beast. As a side note, its cousin, the Burrowing Snagret, can't be stunned because it is attached to the ground. Though less effective than Purple Pikmin but worthy nevertheless, one could use Yellow Pikmin. As said earlier, the Pileated Snargret's leg makes its head hard to reach. Thus, using Yellow Pikmin can eliminate this problem. Take a manuveurable group of Yellow Pikmin and spray them with ultra-spicy spray. When the enemy comes out, toss them at its head from behind. If done right, your yellows will hit its head, and it will be forced to go underground without eating anything. They won't cause as much damage at once as purples will, and this may need to done two to five times. But, because your Pikmin are going to be hitting their mark more easily, this could prove to be a more useful strategy. Another, safer, yet more time-consuming strategy, is to run around and wait for the Pileated Snagret to emerge. Every now and then, the Snagret will have trouble coming out of the ground (similar to the Burrowing Snagret). Toss the Pikmin on it during this time. When it fully emerges, it'll be too weak to attack, and burrow underground again. Repeat until the creature dies. Of course, the creature can always be petrified when the head is emerging, even when it is not having trouble getting out, making it possible to attack the head easily. When it leaps quickly out of the ground, it is possible to throw Pikmin onto it safely while it's balancing itself. Note that you have to be precise with your aim. Alternatively, you could throw a Pikmin onto it from a distance, but be wary of the fact that it will follow you, so you will need to throw quickly. Also, if you only throw one or two Pikmin on it, it will still be able to attack you once before burrowing back into the ground. Particularly: Elaborate and add to the glitches article. Sometimes this creature, and the Burrowing Snagret, may still remain alive with what appears to be little or no health. Also, if a Pikmin stands directly where the Pileated Snagret dives into the ground, the Pikmin will be taken under the ground, and will die with the sound as if it were thrown off into an abyss. Sometimes the Pikmin will make the sound, but will not die. This is most likely because they were shoved into the ground, and then knocked back by the Snagret's foot at the same time, saving them. The word "pileated" means "crest", or the tuft of feathers on a bird's head in this case. It might be called this because, when compared to the Burrowing Snagret, its head feathers are of a strong red color. In Japan, this boss is called アカヘビガラス?, which translates to "Red Snake Crow", which is the same as the Burrowing Snagret's name, but with "red" before it. Its scientific name is Shiropedes ambulatria. Ambulatria is similar to the Latin word for "walking", ambulatura. This is because this Snagret can walk on the ground by hopping, unlike to the Burrowing Snagret. Internally, it is called snakewhole, which is a change on the Burrowing Snagret's internal name in Pikmin 2, snakecrow. It is called "whole" because unlike the Burrowing Snagret, one can see its whole body. A Pileated Snagret on the Piklopedia. The creature's e-card, #51 (12th red card). In Pikmin 2, this enemy and the Burrowing Snagret shake the least when damaged, i.e. their model stretches the least amount of all enemies. Stuck Pileated Snagret, a glitch encountered in the Piklopedia's Pileated Snagret entry. This page was last edited on January 12, 2019, at 11:27.